The Rural Roots Trail was created by The Market at Grelen to entice visitors out to their lush, leafy neck of the woods. If you were to drive the perimeter of the Trail, it would look something like this. But if you only skirted the outside, you'd miss all the goodies within. So we’re here to help. Start with this Four-Day Itinerary, which serves up a small taste of the Trail’s fare. Then come back soon for everything you missed. 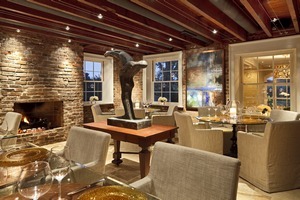 Get a jump on the weekend with a Thursday check-in to the private Boxwood Villa. Pre-order a hot casserole and some Virginia wine (or cider, or beer) from The Market at Grelen and eat in – the food will be ready to pop in the oven when you arrive. The house is set up for entertaining, so there's plenty of room for you and up to nine of your friends in the five large bedrooms, stylish library and living room, full kitchen and breakfast room, and a large open-studio space on the top level, perfect for starting your day with some Om. 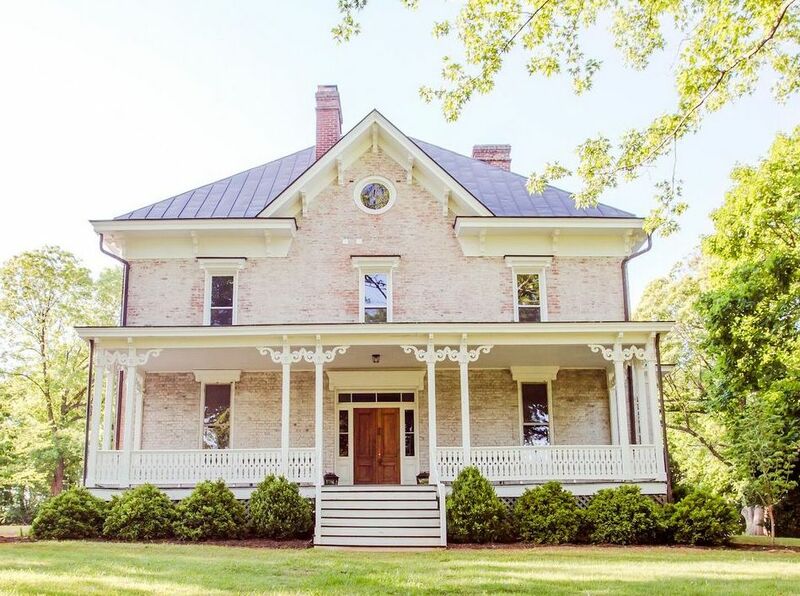 It's a 20-minute drive through the country to the tiny town of Gordonsville, where you'll fill up on bite-sized, homemade Konfections and coffee at Krecek Kakes, and then meander the main street. Stop in at the Laurie Holladay Shop and get Laurie's take on your current interior design dilemmas, then peruse her rooms filled with lamps, shades, and one-of-a-kind furniture. Next door, Relics to Rhinestones sells a polished assortment of vintage “found” objects and antiques mixed in with the new, from furniture to art, jewelry, and decor. 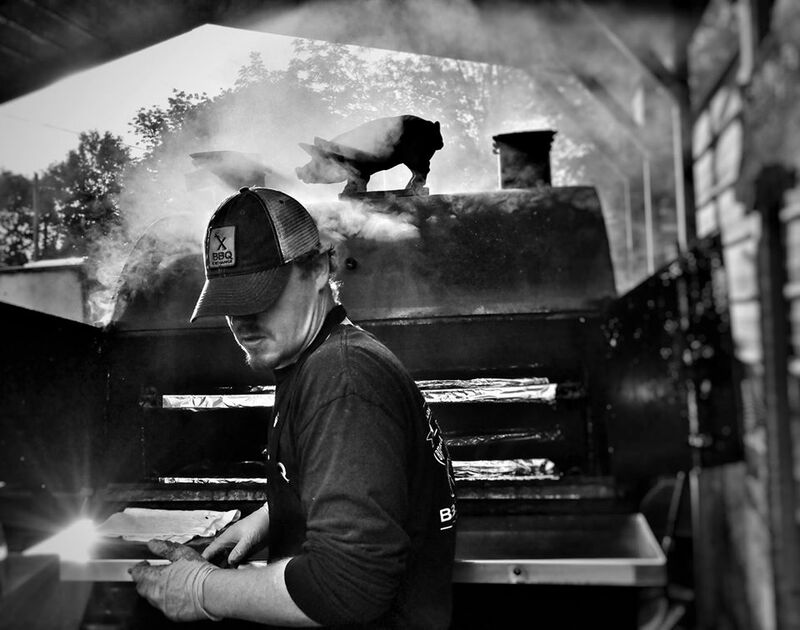 For lunch, grab a picnic table at the BBQ Exchange, just a 5-minute walk away. Hickory-smoked and slow-roasted pork shoulders and spareribs are the specialty here, along with local craft beer, cider and wine. After your pork-out, while away the afternoon back on Boxwood's front porch - think cold lemonade and a hot novel - or stretch your legs on the Villa's 1/2 mile walking trail. For dinner, a three-mile drive takes you to Vintage at the stylish Inn at Willow Grove, where you can opt for romance in one of several cozy dining rooms, or relaxed pub fare in the bar. Customers have called Vintage’s salads “edible works of art” and the jumbo lump crab cakes star both as appetizers and as entrees. 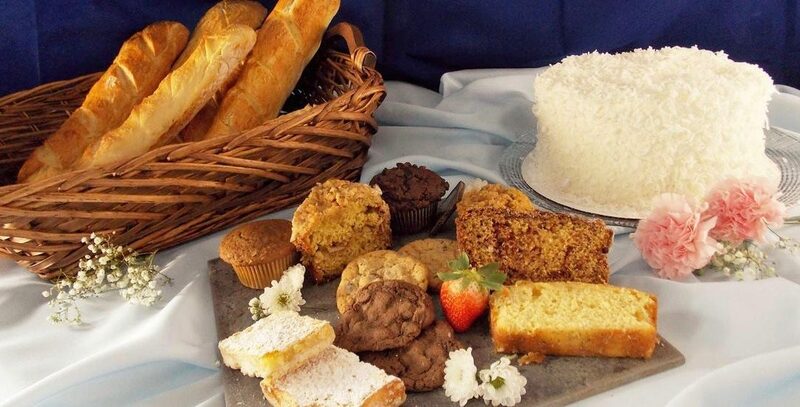 The Market at Grelen’s casual Café has a full menu of Virginia-made snacks, plus fresh sandwiches and salads for lunch, which you can enjoy on the patio, along with the mountain views. 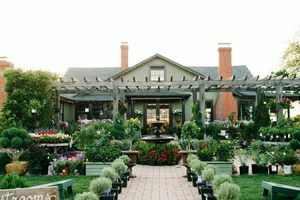 Don’t miss the Garden Shop, the place for everything from Fairy Garden supplies to rustic décor pieces and statuary, all beautifully displayed. 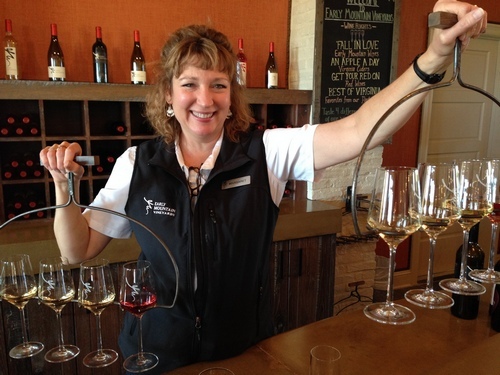 This afternoon is all about Virginia Wine Country. Back at the Villa, get picked up by Central VA Wine Tours for a few hours of rambling the countryside. 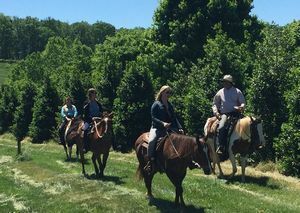 We recommend a first stop at Castle Hill Cider, where you can sample authentic, old-World cider, and then on to Early Mountain Vineyard for a tasting of the winery’s estate-grown bottlings as well as several “best of” wines from elsewhere in Virginia. Early Mountain has a full menu of small plates, sandwiches, pasta and sweets you can choose from for a light dinner, and acres of space – both indoors and out – for relaxing before heading home. Snooze the morning away before taking a short stroll into Orange, where you can grab a table for brunch at The Light Well, a homey, renovated hardware store with high, pressed-tin ceilings and big front windows. The coffee is roasted locally, and you can get excellent Shrimp & Grits for $8. Before calling it a weekend, check in next door at Objects on Main. 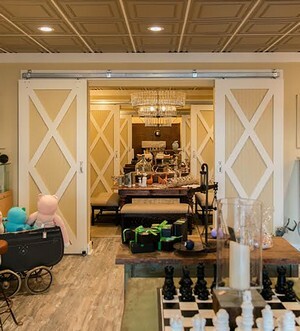 Choose a memento from their “rustic farmhouse meets modern flair” shop to remember your Rural Roots Trail getaway long after you’ve left Boxwood Villa. 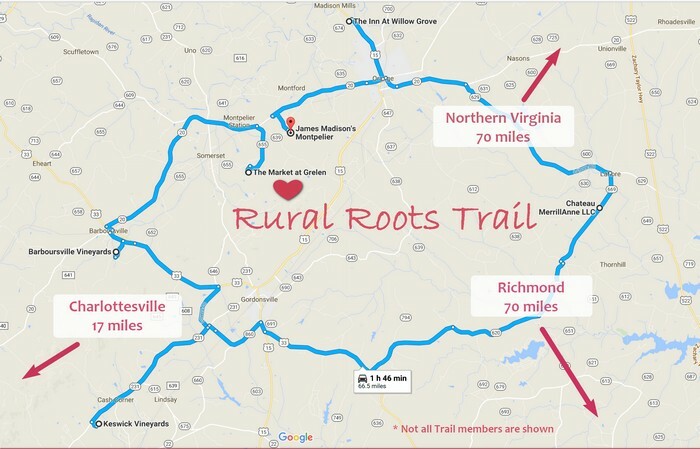 Follow the Rural Roots Trail!